TOS-MAI due to potassium guaiacolsulfonate properties reduces sputum viscosity and facilitates its evacuation from the respiratory tract, providing a dry cough transfer into the wet form. TOS-MAI – effective remedy for dry cough! adults and children over 12 years of age – 1-2 lozenges 4-6 times per day (up to a maximum of 16 lozenges per day). TOS-MAI is a unique1 four-component Spanish product that relieves attacks of dry cough within 15 minutes2. Composition: each lozenge contains dextromethorphan hydrobromide 2 mg; benzocaine 0,2 mg; sodium benzoate 15 mg; potassium guaiacolsulfonate 35 mg.
Spanish product TOS-MAI for dry cough. 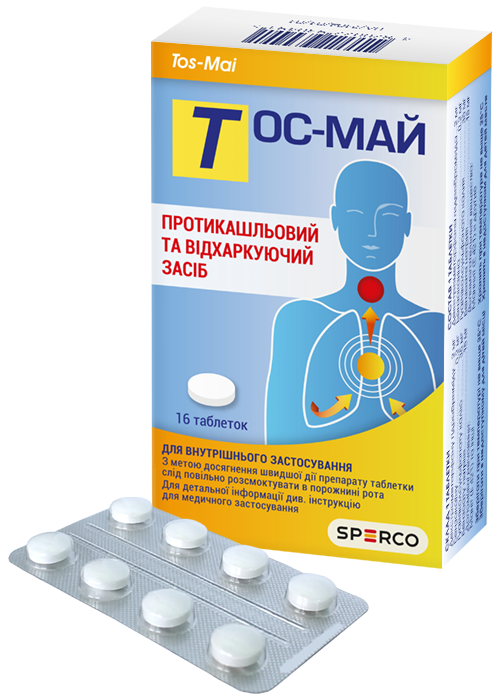 TOS-MAI provides fast relief for dry cough attacks in just 15 minutes2 and fast relief for sore throat in just 1 minute4. Facilitates bronchial drainage3. Does not cause respiratory depression and develop dependence. TOS-MAI contains 2 ingredients that help your dry cough turn into wet promoting fast recovery. TOS-MAI – for children 6 years of age and older. TOS-MAI provides fast relief for dry cough in just 15 minutes and fast relief for sore throat in just 1 minute. children 6-12 years of age – 1-2 lozenges 4 times per day (up to a maximum of 8 lozenges per day). Tos-Mai lozenges must be dissolved slowly in the mouth to achieve clinical efficacy faster. Lozenges contain anise essence and menthol ensuring a pleasant taste. There are no analogues in Ukraine1. For detailed information on the medicinal product Tos-Mai, please see “Package leaflet” page. MA No. UA/2104/01/01 dated 31.10.2014. 1Exclusively on the territory of Ukraine according to PharmXplorer system data provided by Proxima Research LLC as of 2 November 2017. 2Cough-depressant action exerts its effect in 15-30 minutes and lasts 5-6 hours in accordance with the Package leaflet. 3It shall be understood to mean that dextromethorphan does not suppress the activity of bronchial ciliated epithelium in accordance with the Package leaflet. 4 It shall be understood to mean benzocaine effect based on the data provided in the following research article: Ruetsch YA, Boni T, et al. From cocaine to ropivacaine: the history of local anesthetic drugs. Curr Top Med Chem. 2001; 1(3):175-182.